Post-party for the Utah Spartan Beast at Margaret Schlachter’s and Forrst Call’s home . No sodas or juice boxes were to be found – thirst quenched instead by coconut water. No television chattering in the background. No iPhones doing their best work – stealing attention from the people beside them. It was just obstacle racers, doing what obstacle racers do after a long, difficult race. Hobie sat with an ice pack on his head trying to cool down while simultaneously relating the difficulties of swimming. Brad Fredericks busied himself with conversation concerning gear and sponsorships. Margaret enthusiastically illustrated her ideas for an obstacle race at an iconic sporting venue. Irene detailed how she and Hobie grow sunflower plants to be harvested – not as a flower, and not the seeds, but as a delicious green snack. JK #1 described to the enthralled audience the alternative treatment he had received for an injury. Joe Kauder (aka Tony Stark [inside joke]) sat quietly (and alarmingly glazey-eyed), simply relishing in the fact that he had completed not 1, but 2 laps of the Beast. Forest provided a tour of his urban garden, discussing in detail some of the challenges of nature. Elliott was lying on the ground, grimacing occasionally as the foam roller bit into his IT Band. The few kids in attendance entertained themselves by swinging on a rope. To the average American this may have appeared to be a scene from some obscure movie, a comedy of uncommon and esoteric behaviors. As I sat there drinking in the scene, I realized the stark contrast with typical societal behavior. I also realized that I felt 100% at home and no one in attendance saw any of these behaviors and conversations out of the ordinary. When obstacle racing transitions from just a hobby or an event to a lifestyle, it is sometimes accompanied by dismay from family, friends, and co-workers, who observe us pushing boundaries of ‘normal’ behavior. Nutrition preferences change. Gym memberships are cancelled in favor of sandbags, climbing walls, and rugged trails. Scars and bits of dried mud and blood become commonplace. 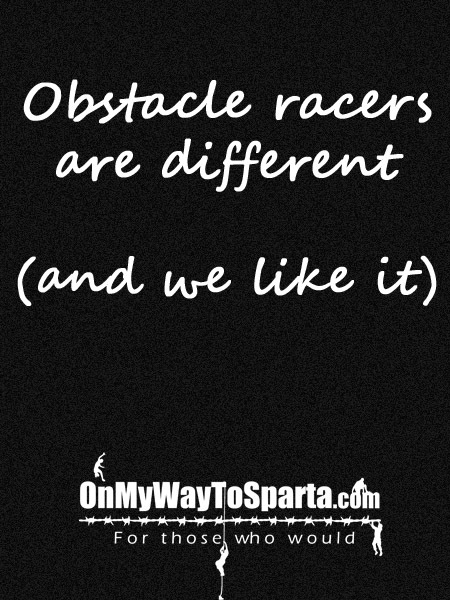 Obstacle racers tend to slip to the outer fringes (and beyond) of the society of ‘normal’ people. Yes, we’re different. It’s noticeable. Yet, as an entire racing community, those who live on the OCR fringe aren’t really mysterious, odd, or a novelty. We are merely who we are……. and in this group, we’re normal. If you have experienced these moments of being “normal”, feel free to share them here or on the On My Way To Sparta Facebook page. Previous Steroid use in OCR?